I have legend and antidote as racks... how does one also get a vst from them? Just had a quick look through their site and I did not see where one might go to achieve this. Antidote doesn't come as an RE - however, when I briefly switched entirely from Reason to Live, I wrote their support, and got a good deal on Dune 2. Same with Legend, simply write their support and explain you have the RE, and ask kindly for the VST. 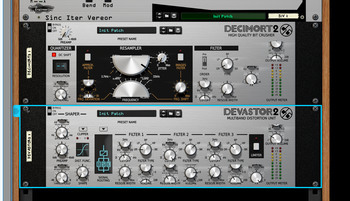 I get similar scrolling knobs but in my vst pictures. I haven’t updated yet. I just updated to 10.2.1 to see if it solved my Vst pictures issue... see link to full explanation above... and it didn't. Reopened Reason and the pictures are back to being messed up. I can't be sure but it mainly seems to affect Vsts that have some modulation/movement of parameters in the initial patch. I'm just hoping that any fix to the issue chimp_spanner pointed out fixes my vst snapshot image problem too. It is a major issue for me. Makes choosing device by image unusable really due to all the scrolling due to the repeated knobs. Wow, we definitely didn't see this during testing! We'll look into this ASAP. Could anyone with this problem please write down with which REs it happens, what OS you're on etc. Edit: these results aren't always reproducible, i.e. i could create Audiomatic last try but still not Selig Leveler or Deesser... Weird things are happening! Last edited by Zac on 27 Nov 2018, edited 1 time in total. Just updated to 10.2.1, found a new bug! The metronome is out of sync! Are there more users with this problem? Operating system? PC / Mac? Which version? Tonight i will post a video! Thanks! I'm sure that this info will help the Props out! Yeah I submitted a support ticket with all the right info. Any chance we can get a rollback until the update is updated with another update? I’ve got some Legend heavy projects atm and it’s really weird working with them. *Edit: D16 plugins also exhibiting the same behaviour. Last edited by chimp_spanner on 27 Nov 2018, edited 1 time in total. I’ve got some Legend heavy projects atm and it’s really weird working with them. Well I haven't upgraded and just now, for the first time ever, I got a "Reason has stopped working in Windows" message. I had just synced all my REs so don't know if that had anything to do with it. I'm getting the glitch with the knobs as well. Quite frankly it freaks me out. Guess I'll have to downgrade. Is it possible to? I can't find anything older than 10.2.1 on the downloads page. Last edited by miscend on 27 Nov 2018, edited 1 time in total. Ah yeah sorry I thought you meant it was possible to do a smaller rollback, to 10.2. I can't remember what was different between 10.1 and 10.2 that I needed. But I'll sit tight for a fix and if it takes a while, at least there's an option! *Edit: wait 10.2 is the multi lane edit update right? I think I need that I'll just have to put up with the bugged interfaces until they get fixed! Windows 10 home x64 1803. Note that this is only on Windows. I'm getting a bug where the playhead returns to 0:00 position when you cancel recording pre-roll by hitting the space bar (i.e. pre-count is on, hit record...hit space bar before the pre-count finishes and recording starts). can anyone else recreate this, or is it just me?